Before being traded to the Brooklyn Nets, Paul Pierce had been the face of the Boston Celtics franchise for almost his entire career. During that time, he saw ups and downs, but strong fan support has remained. However, the frenzied fan base is only part of the reason that Paul Pierce cards are among the most popular in the league. Known as "The Truth" to much of the basketball world, Paul emerged as a star player during his college days in Lawrence, KS. After a very productive tenure at the University of Kansas, Paul Pierce was selected 10th overall by the Boston Celtics. Despite some early success, Pierce was unable to bring another coveted championship to the historic Boston Celtics franchise. That all changed when Kevin Garnett and Ray Allen joined the Celtics, helping the team win the 2008 NBA Championship. In addition to the title, Piece was named Finals MVP. He has also been selected to ten NBA All-Star teams. Like all players entering their twilight years, Pierce is after that one last championship. 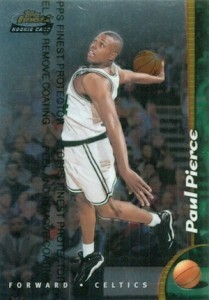 Paul Pierce has nearly 20 official rookie cards. The majority can be found for less than $15 and even the top options are reasonable because none feature his signature. 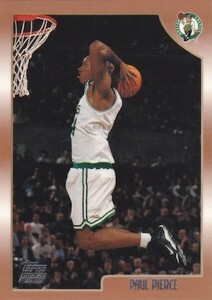 The most valuable Paul Pierce cards include limited print runs or rookie parallels. 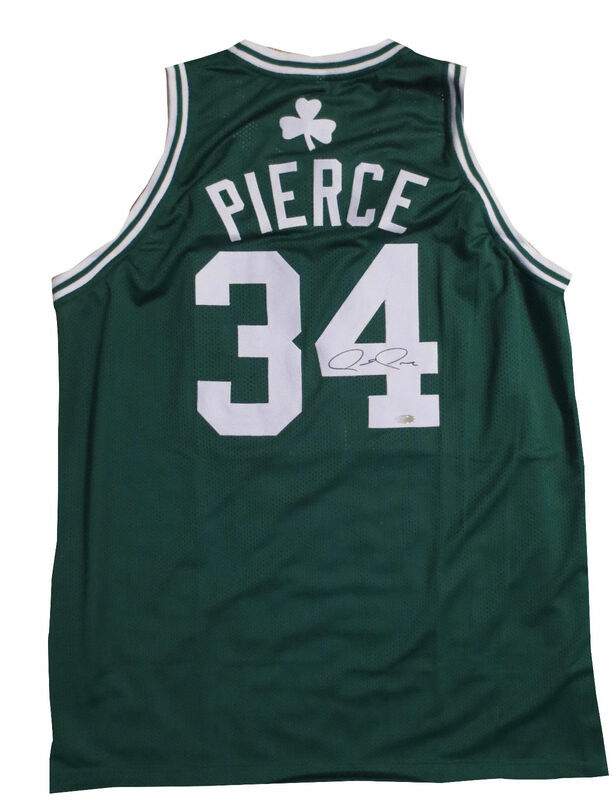 Collectors seeking signed Paul Pierce cards are in luck, as Pierce has plenty of options. However, be aware that his autographs have not appeared in many Panini products lately, so singles are the best bet. Additionally, Paul Pierce cards are included in the 2012-13 Upper Deck All-Time Greats Basketball, which featured only 18 top former and current NBA players. 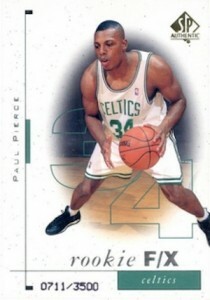 The SPx Finite Paul Pierce card has a refined and ornate look to it. 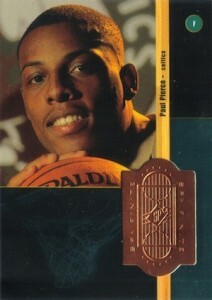 Numbered to 2500, the card features an image of Pierce that is reminiscent of a high school graduation photo. Parallels include Radiance (#/1500) and Spectrum (#/25). Although it features several different design elements, it still comes across a simple card. The "34" is thin enough to not overpower the small portion of the background image that has not been whited-out. On another note, it is interesting to remember that companies used to print the serial numbering directly on the card like a receipt. While a print run of 3,500 seems like a large number, these cards still sell for solid amounts. 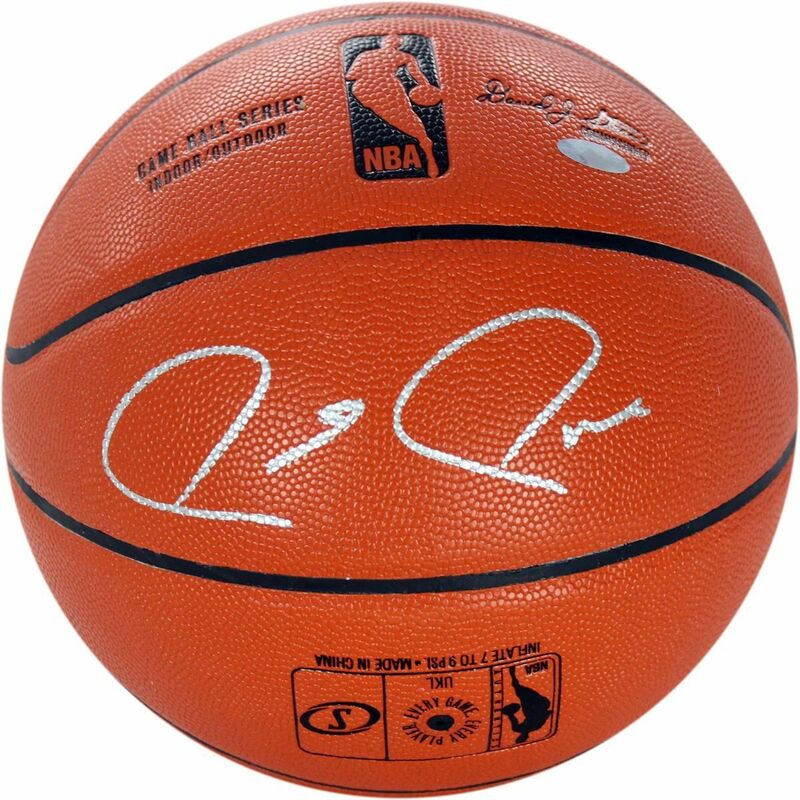 Below you will find an example of what Paul Pierce's authentic signature looks like. This can be used as a first point of reference for determining the legitimacy of autograph memorabilia, but is not a substitute for having your items authenticated by a well respected professional autograph authentication company. Reputable authentication companies include JSA, PSA, Panini Authentic and Mounted Memories to name a few. Click on any of the images below to view full size photos. The whole signature primarily consists of two letters, the initials "P" and "P."
The letters lean back to the left and the loops are oval in shape. The horizontal line resembling a musical note lying on its side, implies the letters "a-u-l."
The horizontal line off the second "P" implies the letters "i-e-r-c-e."
PAUL PIERCE 04 UPPER DECK TRIPLE DIMENSIONS STANDOUT SIGNATURES AUTO CARD # 100!